It could be the beginning of the spring flush, or it could be another blip in what has been an exceptional spring for prices. The rainfall this week might also have something to say about lamb prices in the east, but in the west they look like good buying. There is an interesting east/west paradox going on in the lamb market. In the east restocker lambs are trading at a 50-90¢/kg cwt premium to trade lambs. 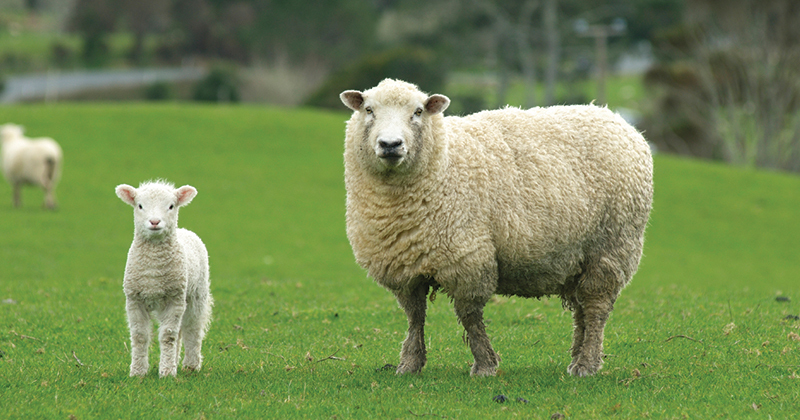 In the west, trade lambs are priced at 542¢/kg cwt, and restocker lambs at 489¢. If we work on a 16kg cwt restocker lamb, it makes east coast lambs $122/head with a $5 skin. In the west, the same lamb is worth $83. Historically this is a decent price, but it brings shipping sheep from west to east into play. Despite yardings falling this week, prices have eased. The Eastern States Trade Lamb Indicator (ESTLI) lost 16¢ to 611¢/kg cwt in the week to Tuesday, but as shown in figure 1, remains well above last year’s levels. Mutton markets defied the downward movement, with Victorian and NSW remaining solid at 466 and 450¢ respectively. 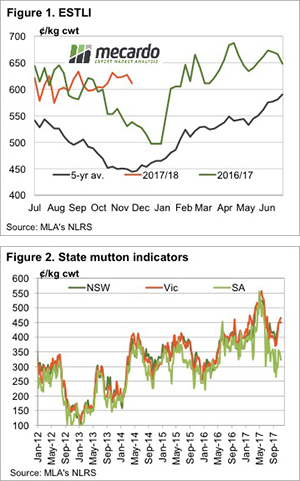 Vic and NSW mutton values have rallied 25% in the last month with demand seemingly the driver (figure 2). Figure 2 also shows that in South Australia mutton is only 330¢, which makes them cheap, and worth shipping to Victoria. Major lamb districts in Victoria and South Australia have seen exceptional rainfall in the last few days. The rain is likely to see lambs held back, especially if the market eases as Western Victoria and South-East SA are likely to be green until Christmas. Slaughter figures will tell the tale of lamb supply, and give some pointers to what might happen in the New Year. But don’t be surprised if after this rain the spring flush of lambs is lighter than normal.